After acceptence of your registration, the registration fee has to be paid within 14 days (unless we clearly state otherwise in an e-mail sent to you). If we do not receive your payment within 14 days, your registration will be cancelled. For a valid registration as member of Swing in Regensburg e.V., the membership has to be confirmed prior to registration. Please understand that in case of a cancellation we can not refund already paid registration fee. You can transfer the registration to another partcipant in the same role, or you can donate the registration fee to the society Swing in Regensburg e.V. and get a donation receipt. If you cannot attend the event it counts as a cancellation, no matter what the reason. So a cancelled flight, an injury, an illness, a sudden working weekend or anything else counts as a cancellation and the according terms are applied. We cannot take any responsibility for your valuables or physical safety. Be careful – look out for yourself and for others as well! The classes will be on wooden floor. Please help us build a good relationship with the owners by not wearing shoes that can damage the floor. Damage can come by wearing outdoor shoes (please just use your dance shoes) or by hard high-heeled shoes or tap-shoes. Even the black stripes that some shoes leave behind are often considered as damage by the owners. You can smoke only at the designated smoking areas. Please ask the organizers about these locations. We announce all lost & found properties on the web page within a month after the event finishes. We keep them for two weeks after the announcement. Contact us if you spot any of your lost items. We dispose all non-claimed items or offer them to non-profit organizations. By participating at the Swingin‘ R – Regensburg Lindy Exchange you give your consent that we can use, modify and publish any photos, videos or other form of media where you might be included (visible and audible). Personal data are only enquired and processed in order to prepare and run this event and will not be transferred to any other third party institution or person. The data will be deleted after this event. 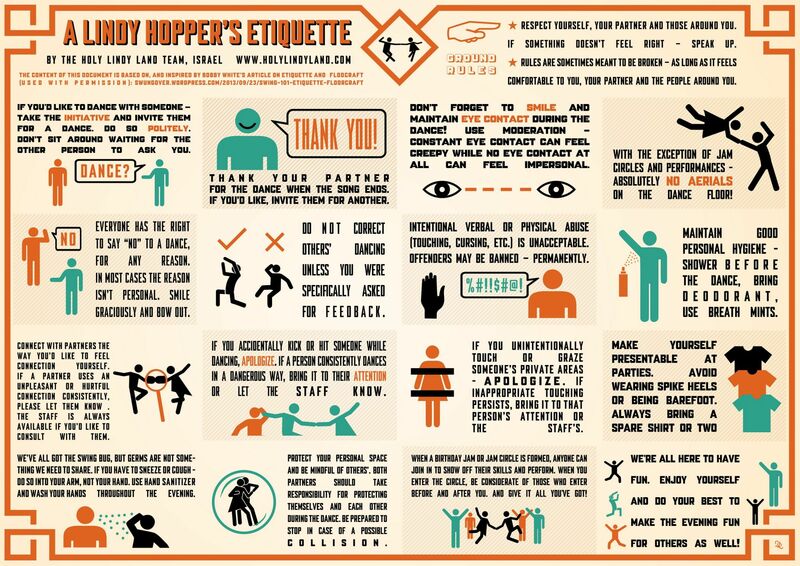 All participants have to respect the following Code of Conduct, which was put into this great infographic by The Holy Lindy Land.